I’ve spent enough time unpacking and organizing and am ready to bring on some pretty in our new house! I’m trying very hard to be intentional when it comes to decorating this house. But being intentional translates to being patient and that is so hard for me! 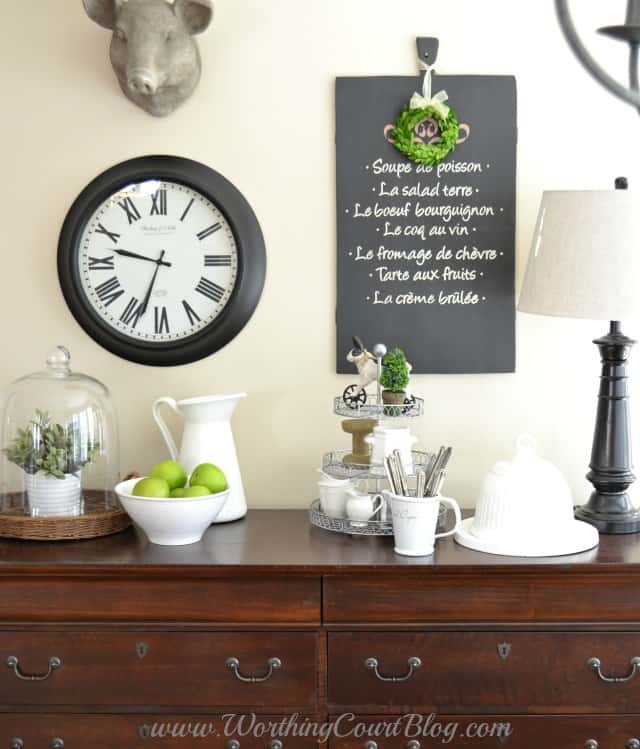 In the kitchen at my old house, I longed for a piece of furniture to use to display favorite things and to store table linens, but there wasn’t one single bit of wall space in that whole kitchen where I could put anything. There’s plenty of wall space in the kitchen in this house though and that’s one of the many reasons why I fell in love with it. I didn’t have any luck prowling Craigslist, but a trip to Salvation Army yielded pure gold! I scored a well made dresser (and mirror that I can use elsewhere) that is perfect for my kitchen for just $57. It’s a good thing that I was ready to take it home with me right away because someone tried to buy it out from under me. 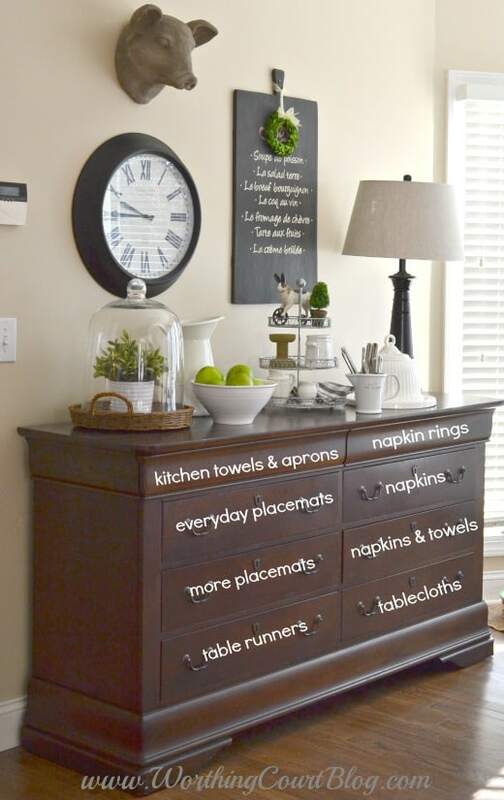 This dresser is perfect for holding all of my kitchen towels, aprons, placemats, table runners, table cloths, napkins and table setting paraphernalia, like napkin rings. Plus, it can double as a buffet if I need it to. Everything is stacked neatly into each drawer. 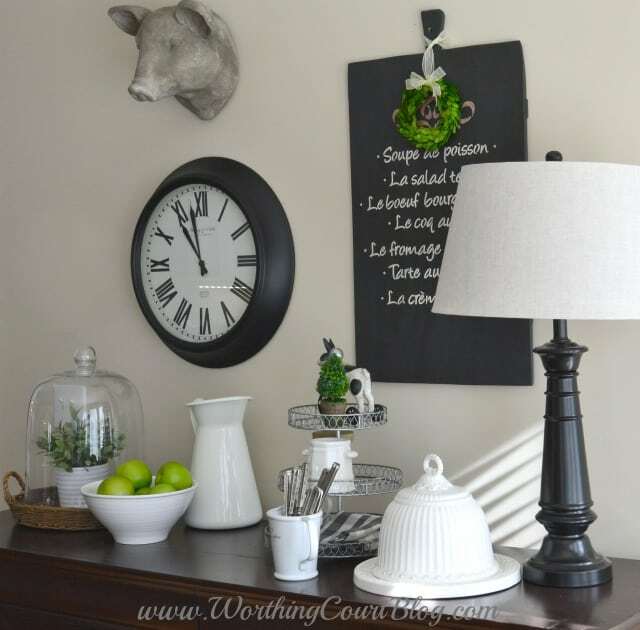 My intention had been to paint the dresser gray, but once I gave it a thorough cleaning and lived with it in the space for a few days, I decided that I really liked the original dark wood finish. 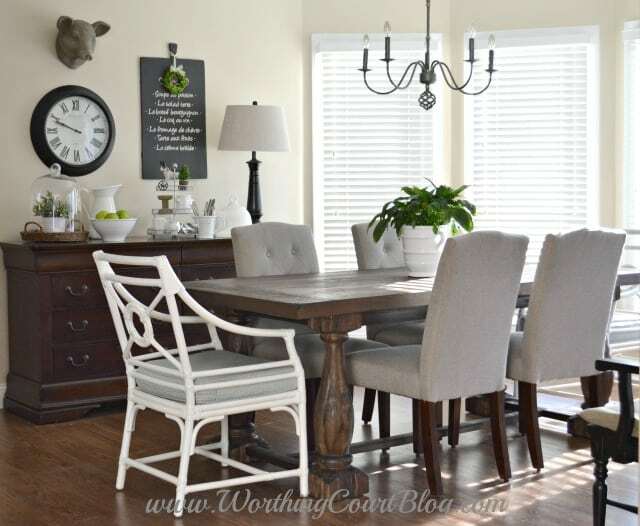 The side chairs at my table are covered with a gray/brown/flax heather fabric and the kitchen island cabinets on the other side of the kitchen are gray, so I decided that having a gray dresser, even if it was distressed, would be too much. I think that it looks great with the dark wood of the table and the brown and gray specks in the chair fabric. BTW – I haven’t decided what to do with the end chairs yet. Instead of putting open shelves above the dresser, like I originally planned to do, I opted to put a grouping on the wall and display some of my favorite things on the surface of the dresser. I’ve been collecting white dishes and crockery for quite a while in anticipation of someday being able to have the kitchen of my dreams. I can’t wait to share the rest of the space with you! I have a thing for bunnies and I just love this little folk art guy on wheels. 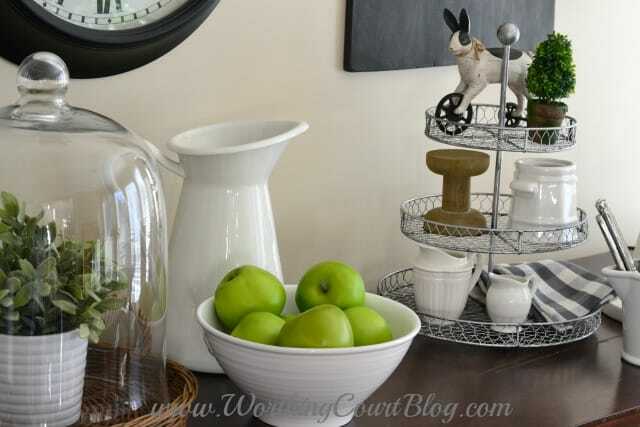 I also used a bowl filled with faux green apples, a cloche covered plant on a wicker tray and a crockery cloche and platter that I found at a local home decor shop. I always turn the lamp on at night and it makes the whole space so cozy. You might recognize the chalkboard menu from my last kitchen. It always looked out of place in that kitchen, but I love it here. Especially with the addition of a preserved boxwood wreath tied around the handle. You can find the tutorial for the menu board HERE. This is my view from my spot on the couch every night. I can’t stop looking at it. Maybe I sound silly, but I’m so happy to be rid of the dark kitchen that I had before. Check out what I did on the other side of the breakfast area HERE. It looks lovely! The darker color does really make a gorgeous juxtaposition against the fresh grey! Great find! Thank you – I like the dark against the gray too! Pretty. How about using a green the color of your apples on your end chairs? Thank you for the suggestion, Jean! I’ll keep it in mind for when it comes time for me to make a final decision. Great find on that dresser! I can see why someone else was trying to get it 🙂 I love every inch of your decor! Pinning! Thank you, Debbie! Yeah, I could tell that the guy and his wife were pretty mad that they had missed it. 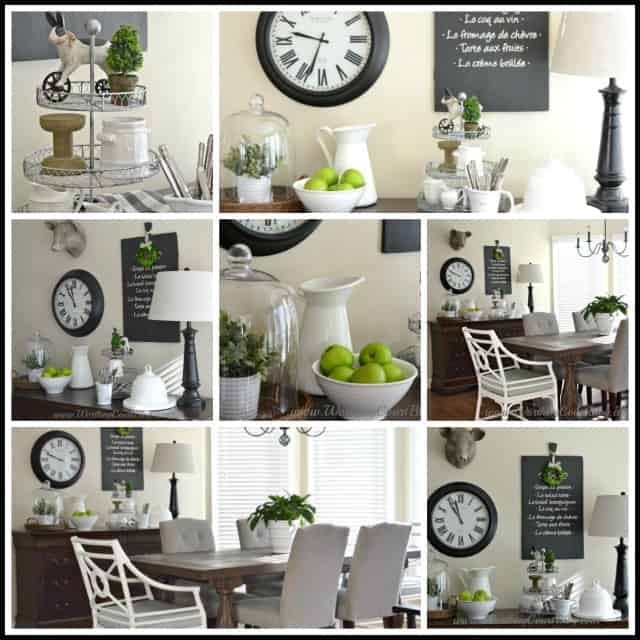 Love your décor!!! I would paint or stain the chairs to match the dresser. Thank you, Pat! Hmmm…never thought about painting them to match the dresser. Another idea to file away! Awww…you’re too sweet, Shannon. Thank you! Maybe Santa could bring you one for Christmas! Can you show us how you organized the table clothes etc. I have the same dilemma and looking for a way to put it in one place. The dresser looks beautiful! Hi Carmen. Everything is just neatly stacked in each drawer. If you want to take another look, I added a picture to the post that identifies what is in each drawer. Hope this helps! 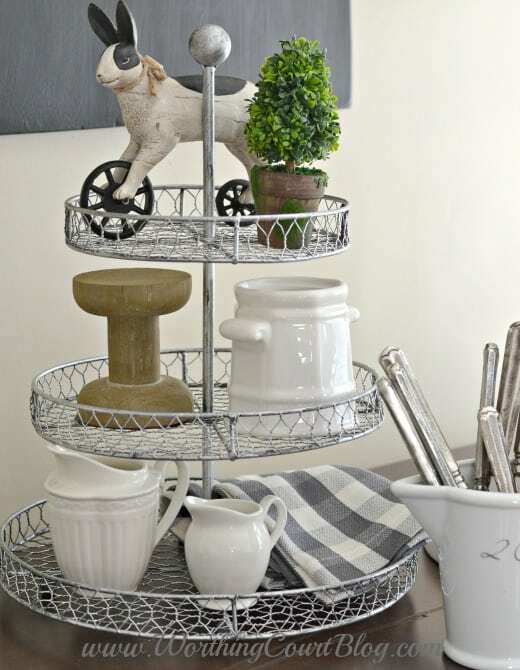 I love the table linen storage. You made a wonderful choice. Thank you so much, Madonna! That is a great piece you got there and storage galore,too. 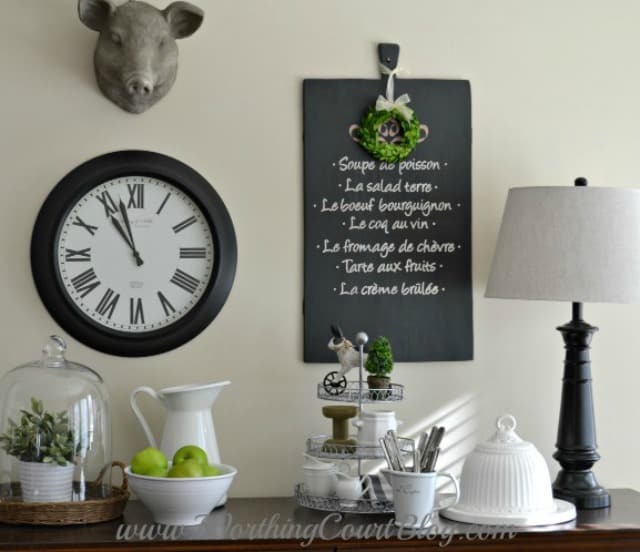 Love your vignette, that pig is just too cute! Thank you, Tina. I love Mr. Piggy too! I had a lot of trouble deciding between the pig head or the cow head. I love them both! You scored that beauty for only $57 ?! WOW! And, here I thought I got a super steal when I bought one identical on Craigslist for $100! 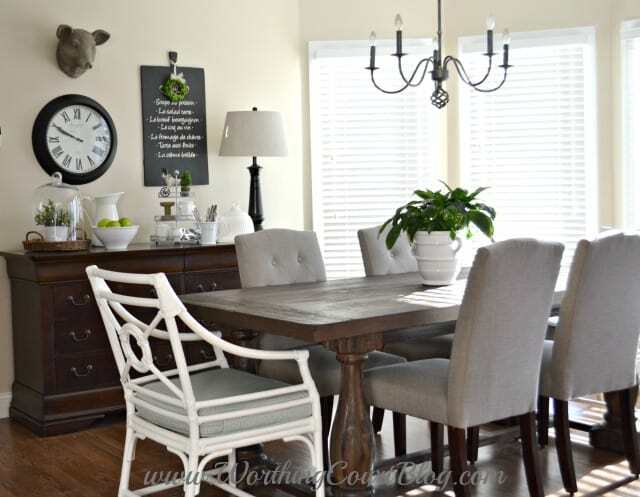 I love how you styled the wall above it, and how your beautiful new home is coming together! I can’t wait to see more, friend! I love the dresser and it doesn’t need any paint either. I love the grouping on the wall. I love it! My buffet has 3 drawers and I use them more than the 2 cabinets on the side. I use it to hold coloring books and kids art stuff though. LOL. Happy Holidays! Love the new dresser/sideboard…the whole room looks wonderful! It’s perfect!! I love the pretty vignette on top too!! Oh I love it. Looks like you are making great progress with the remodel. Love this chest and it definitely is perfect for storing linens. Great wall collage. Thanks tons for linking to Inspire Me. I need to change my decor but it all seems so daunting. Your site inspires me! Perfect! 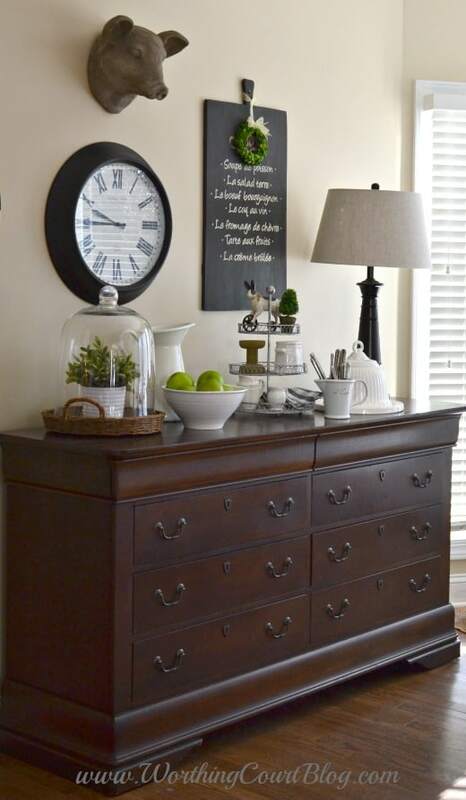 The dresser adds to the charm of the room and I’m glad you kept the darker color. Everything blends together perfectly. I love it! Cute idea for the dresser! 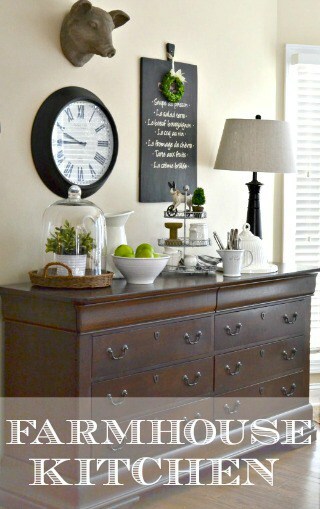 Love that dresser-great looking solution for needed storage! I am on the hunt for a piece like this. Thank you Suzy! !